1. For most advertising material working,such as acrylic ,artificical stome adv.board, name plate, breastplate, CHRY, copper stampes, indicator drop, art craft, wood crafts, cnc panels, model-building, precision blanking die, hot cutting for iron, copper, alumium, plastic board, PCB board, wash gold board, clamp mark board, electrode, etc. 2. Plate cutting ,like flat plate,3D wave board,aluminum honeycomb panle,aluminum-plastic panel and 3D ornamental engraving process of aluminum profile . 1. The lathe is founded by industrial pipe welding which ensure the high stability. 2. 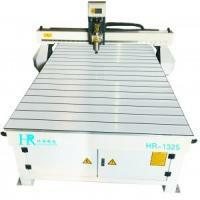 Movable table design, good mechinical stability, high accuracy workpiece. 3. Imported germany ball screws are applied on X,Y,Z to ensure the high precision. 4. Breakpoint memory guarantees continue processing. 5. High power step motor, high speed, low noise, run smoothly, large torque. 6. NC control system can compatible with many kinds of CAM software, such as TYPE3/ARTCAM/CAXA/UG/PRO-E/MASTERCAM/WENTAI and so on.